Tooltips are a square deal. They allow for the placement of important information just in the very location this information is needed, regardless of screen real estate. 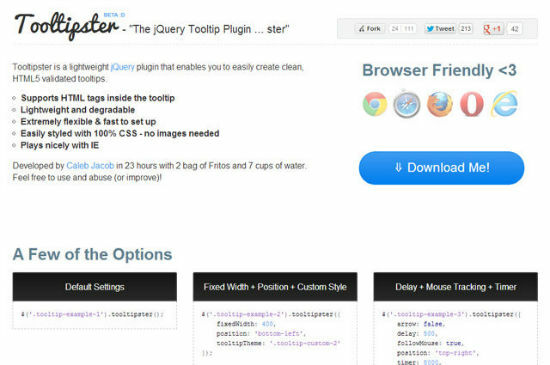 Tooltipster is a plugin for jQuery aiming at making the process of creating tooltips as easy as possible while providing the biggest functionality available. They conform to HTML5 and can be styled to your own liking using CSS. Conclusion: Tooltipster is a really useful plugin to realize nifty tooltips in practically no time. I saw that you have been sold to SmashingMagazine, is it true or just silly rumours? We have been following Smashing Magazine Closely in our Company to keep up with the global design developments. And this will be an interesting development if true?! We do web designing in India, and have been involved in few very creative design work, have you guys( Smashing Magazine ) been publishing something localized for India?